Sound art, free improv or experimental dance music are by far not the only genres, represented within this 48 artist list – there’s the jazz-laden, warm modern minimalism of Polish clarinetist Wacław Zimpel, the lo-fi, ambient rap of Prague-based artist Lišaj, the “audio theater” of Lithuanian producer J.G. Biberkopf that brings together elements of abstract grime and musique concrete, the austere sonic architecture of Thomas Ankersmit, the post-rock, indie and electronica inspired works of British composer Anna Meredith or the ballads of Norwegian folk and jazz singer Mari Kvien Brunvoll, mostly built out of her voice, recorded in loops and accompanied by kalimba, kazoo and zither. As in previous years, links to prestigious labels can be observed: producer Sky H1 released her debut EP last year via Codes, sound artist and composer Anna Zaradny published her critically acclaimed record “Go Go Theurgy” on Poland’s mostly atonal Musica Genera records and the currently Paris-based boss of L.I.E.S. Ron Morelli participates in SHAPE with his live show, based on the largely beatless “A Gathering Together” – his most recent full-length recording, published by Hospital Productions. 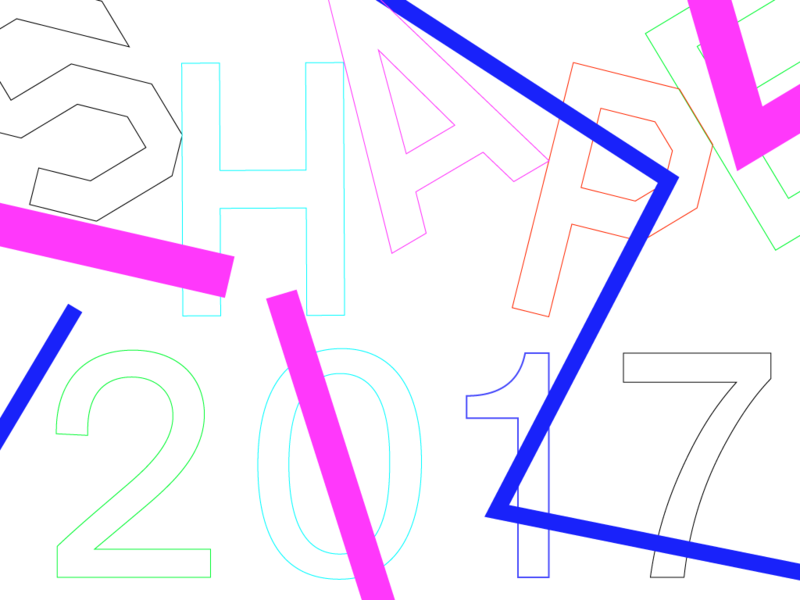 In comparison to previous years, the 2017 artist list of SHAPE puts a larger emphasis also on seeking out interesting DJs – ranging from Denmark’s all-female DJ trio Apeiron Crew, Romania’s Chlorys and Netherlands-based Russian DJ Inga Mauer to Dynamons, the co-founder of Greek label Echovolt Records, or Danny L Harle, representing the kitsch-ridden internet label PC Music. The audiovisual part of the roster includes, among others, Aurelia 1+Hz, a project that focuses on sonification of the movement data of a jellyfish, the French collective CHDH, who create audio and visual algorithmic synthesizers, Julien Desprez with his electric guitar/light performance “Acapulco Redux”, Franck Vigroux with his various audiovisual collaborations, and many others. For SHAPE, the second year formally ends on November 30. During year 2, the platform organized 150 performances (an average of 3 performances per artist) with a female performance ratio of 40% and male performance ratio of 60%. The mobility of 86 artists was facilitated. Already in December, the platform will kick off its third year with its second large showcase beyond Europe – this time, as part of Rio de Janeiro’s festival Novas Frequências (December 3-8). The showcase will consist of 13 SHAPE acts including 2016 alumni Stine Janvin Motland and Gil Delindro, as well as several names from the new roster, such sis_mic, Mr. Mitch, Toxe, Mike Rijnierse, Andreas Trobollowitsch and others. A 3-year initiative co-funded by the Creative Europe programme of the European Union, the SHAPE project reunites 16 European non-profit organizations active within the ICAS – International Cities of Advanced Sound network to create a platform that aims to support, promote, and exchange innovative and aspiring emergent musicians and interdisciplinary artists with an interest in sound.